Okay - it has been way too long since I've done a Cool Warrendale Thing of the Week. So long that some folks might wonder if I thought Warrendale was still cool. Anyway, every neighborhood has Christmas lights but I've always thought that they ones in Warrendale were extra special. We manage to walk the fine line between being down-right gaudy and oh-so boring; all with a sense of classic midwestern charm. The bad news is that I don't have my digital camera with me. I seem to have misplaced the thing; pretty sure that I left it at one meeting or another. Therefore, I'll have to make do with a photo from last year. The lights are the same but (unfortunately) there's no snow on the ground at the moment. 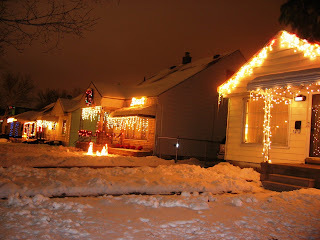 Without further ado, Christmas lights are officially proclaimed the Cool Warrendale Thing of the Week for the week of December 20, 2006.